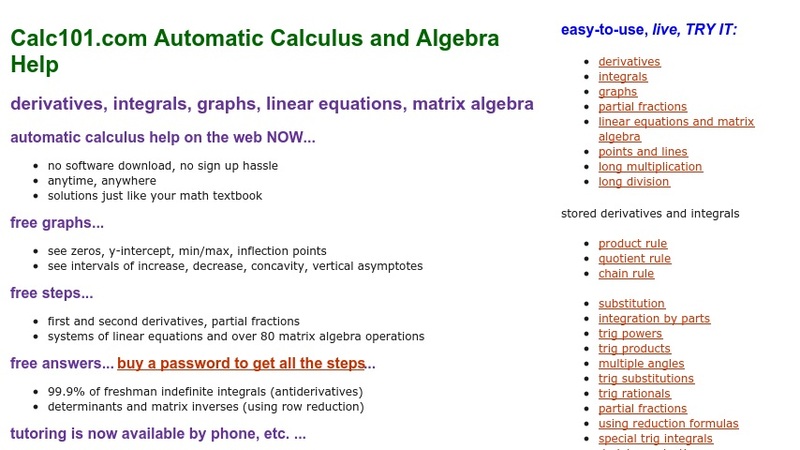 This website, which uses a web version of Mathematica software, "supplements text books by giving you step-by-step solutions to the two basic operations of calculus:" derivatives and integrals. Some features, such as step-by-step solutions for indefinite integrals, determinants and matrix inverses, or systems of linear equations, are available only with a paid subscription. However, visitors can request online solutions to derivatives, long multiplication and long division for free. Examples of derivatives instruct the user on the proper input format for Mathematica. The website will also create a graph of a function and its first and second derivatives, but only partial solutions are provided for free. The website is also available in French, Spanish, Japanese, and German.